Update 6/19 - Leaving with a bang. I went to an Office Max I've never been to before in Buffalo (1701 Niagara Falls Boulevard, Space 700) and asked if they have any $200 visa gift cards. They pulled out a stack of them. The lady did't know that it changed to one per customer and I was able to buy $2000 worth on multiple cards for net gain of $30 and 2,000 points! Update: 6/11 - My local office max started only allowing one per person which makes this far less lucrative. Your local office max may or may not enforce this. 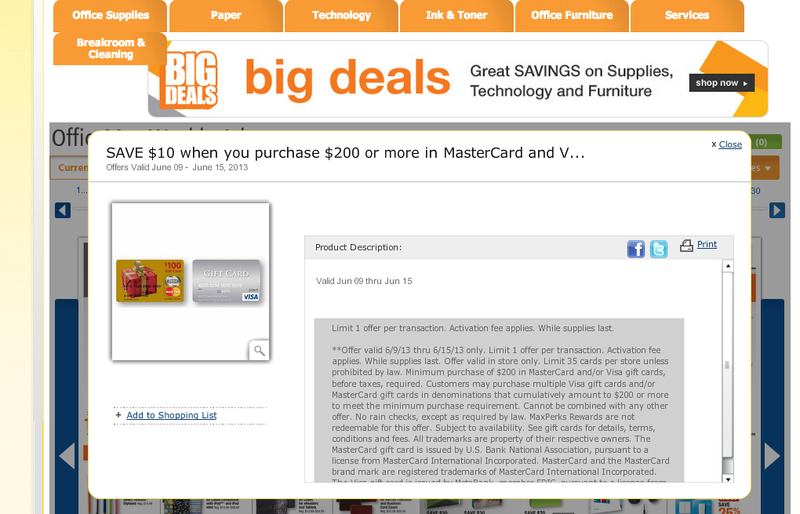 This week, June 9th-15th22nd, Office Max is offering $10 off the purchase of $200 or more in Visa or Mastercard gift cards. Visa and Mastercard gift cards normally have a high activation fee that make this cost prohibitive. However, with $10 off, it will more than cover the fee for the $200 cards. There is a limit of one $10 bonus per transaction, not per household. The limit is 35 per store, which comes out to $7,000 of gift cards so you might be able to make a nice amount of money pretty easily. It is very unlikely that you will find any denominations larger than $200 and you might find $200 cards, but even if you only find $100, the discount will still cover the fee. This is a chance to get some free spending on your credit card and maybe even to make some money on the actual purchase along the way. Assuming you buy the $200 card with a $6.95 fee, you will have spent $196.95 on your credit card and you get a return of $3.05. If pay with the American Express Fidelity card, you will get another $3.93 in cashback (2% cashback on everything) or just about $7 for every $200 card you buy. Pay with a Chase Ink Bold, Ink Plus, Ink Classic or Ink Cash and you will receive 5 Ultimate Rewards points for every dollar you spend at Office Supply stores. This will be close to 1,000 Ultimate Rewards points for every $200 you spend. Remember that 80,000 Ultimate Rewards points get you a free trip to Israel on United, one of the transfer partners for premium Ultimate Rewards points! You can load the funds from your Visa or Mastercard gift cards that have pins onto a Bluebird prepaid card at Walmart and you will not have to actually spend the money on any of those gift cards. It can be a pain depending on how many you buy, but clearly worth it in my book. There is a limit of 1 per transaction but not one per household. The limit is 35 per store which is $7,000. You could theoretically keep buying them. Don't put all of your purchases on one card. It will look very shady to have $7000 of office max purchases on 35 transactions in one day or even one week and you will probably get a couple calls from the fraud department. Bring all the cards you have and spread out your purchases if you can.